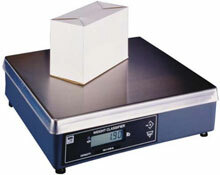 Brecknell 7820 - 100lb, 12" x 14" parcel shipping scale, with ball-top. Includes 10 ft. RS-232 Cable (9 Pin to 9 Pin). The bench scale of choice in shipping departments as a standalone scale or interfaced to shipping manifest systems. The 7820 are simple to use, durable, accurate, and reliable. This NTEP approved scale fits into any operation as a standalone scale, interfaced to a shipping manifest software, or receiving station.